Olaf Valli, owner of surf shop Sick Day, expressed his concerns as a surfer at a public meeting Thursday. 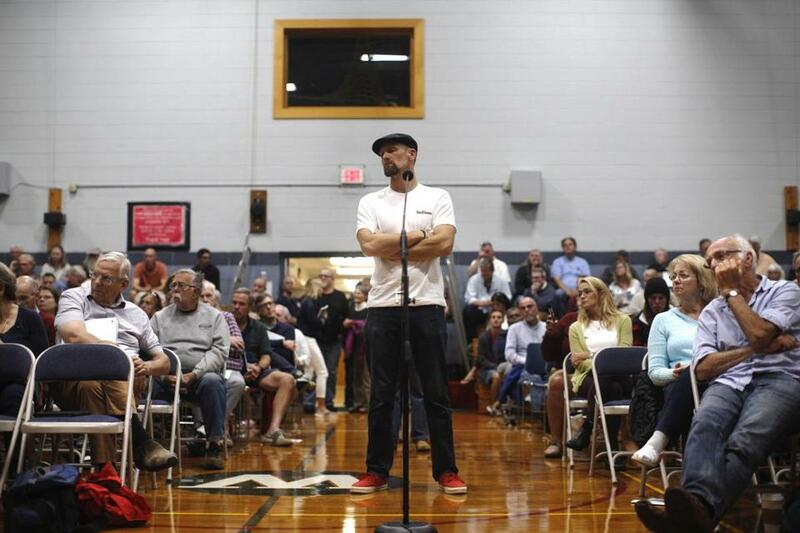 WELLFLEET — Like a scene straight out of the 1975 film “Jaws,” residents gathered Thursday night inside the local elementary school to discuss solutions to a terrifying issue: the heightened presence of great white sharks. 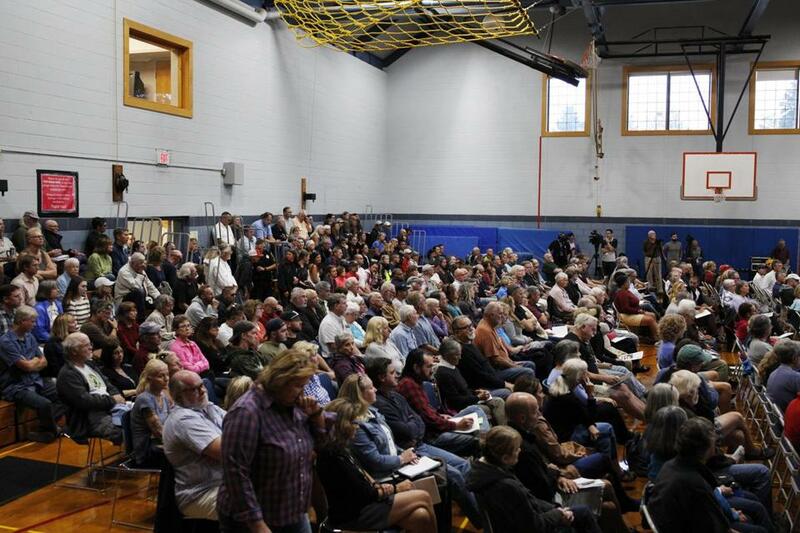 In passionate and occasionally combative terms, around 300 Cape Cod residents filled the school’s gymnasium to voice an array of concerns in front of a panel of local officials, researchers, and shark experts. The meeting came less than two weeks after the shocking death of 26-year-old Arthur Medici of Revere, the victim of the state’s first fatal shark attack in more than 80 years. The forum was scheduled to help educate the public about sharks and discuss “what they can do to limit their exposure,” said Wellfleet town administrator Dan Hoort. Anticipating a heavy turnout, officials earlier in the week moved the location from the town’s senior center to the elementary school. As of late Thursday afternoon, town officials were scrambling to accommodate the standing room-only crowd. 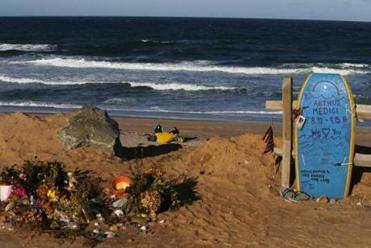 Beachgoers passed by Arthur Medici’s memorial on Newcomb Hollow Beach on Thursday. “Today, I called over and said, ‘Put every chair you’ve got out,” Hoort said. And residents took advantage of the chance to query officials. One by one, residents stood at a microphone in front of a 13-person panel, posing questions and sharing their opinions on how best to deal with what has suddenly become the town’s most high-profile issue. Some said the fatal attack and frequent shark sightings this summer in Cape waters threaten the economy of the tourism-dependent beach town. Others called for better safety measures — from employing more lifeguards (“They call them lifeguards for a reason; get more of them,” one speaker noted), to using drones to track sharks and their travel patterns, to devising a birth control system to decrease the seal population. Some criticized the lack of reliable cellphone service, which can be spotty on parts of the Cape, to help rescue efforts. “You should be on the phone tomorrow with people from communications and have it done next week,” said one speaker. The biggest source of contention, though, was the increasing seal population, which many say is the primary reason for the heavy shark activity. Many residents called for efforts to cull the seal — and therefore the white shark — population, deriding federal legislation that left seals protected at the expense of humans. At times, frustrations boiled over during the two-plus hour meeting. On multiple occasions, Janet Reinhart, chair of the town’s select board, who moderated the discussion, cut speakers short, arguing that certain topics — particularly the issue of culling the seal population — had already been discussed. Members of the community gathered at Wellfleet Elementary School. But some people spoke in defense of the seal population. “We’re in their habitat,” argued one speaker, in a sentiment echoed throughout the evening. At the end of the meeting, local officials seemed encouraged, praising some of the suggestions brought forth and leaving open the possibility of another public forum. But they also insisted that there was much left to be done. Asked what the biggest takeaway from the evening had been, Hoort, the town administrator, was direct in his response. “People want to see us do something — anything,” he said as the gymnasium emptied out. Dugan Arnett can be reached at dugan.arnett@globe.com.